Seamstresses construct figure-controlling, front-lacing corsets in the new 1922 four-story Modart Corset Company building at Lapeer and Second in Saginaw. The airy, efficient workroom with ventilation, heating, and sprinkler systems is lit by widespread windows and overhead lighting near work stations. 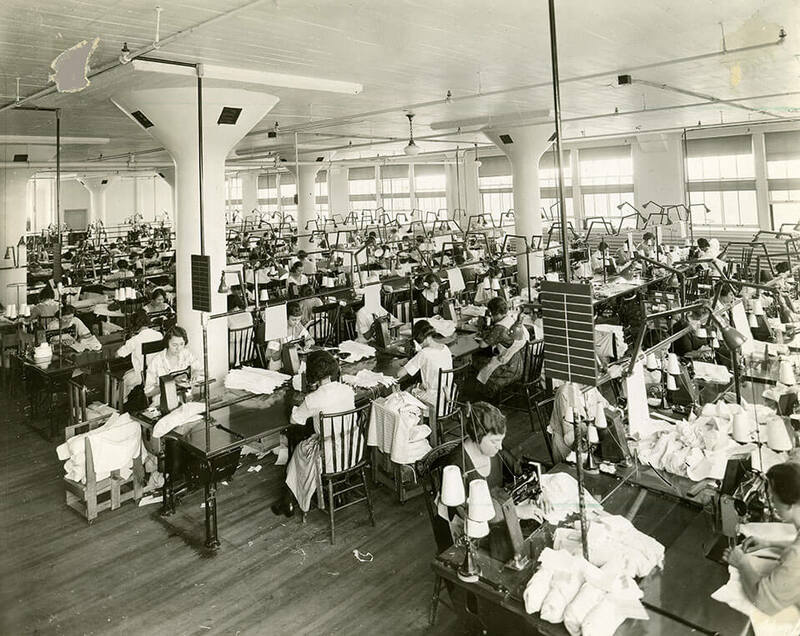 The workplace was created after the infamous March 25, 1911, Triangle Shirtwaist Factory fire in New York City that killed 146 workers and led to U.S. labor reforms and safety laws. corsetry is the reason for the existence of Modart Corset. The Modart business was founded by Leonard T. Jennings (1908) as the LaFrance Corset Company and renamed the Modart Corset Company in 1909. Modart operated at various Saginaw locations and sold its products nationwide. In 1932, a former business partner repurchased Modart and changed the name to LeMonde Corset Company. LeMonde continued producing products under the Modart name until closing in 1969, after decades of relaxed-style fashions and women routinely choosing to manage their figures through diet, exercise, and pantyhose/tights. In 1948, two former Modart employees opened The Corset Shop in Saginaw. Since 2008, the 69-year-old business, renamed Corset Shop Intimates, 5901 State Street, has been owned/managed by Linda Hancock. The shop is an accredited/insurance-recognized post-mastectomy boutique that also offers custom-fit bras, comfortable “shapewear,” high-quality and bridal lingerie, and more—even celebrity-influenced waist shapers and corsets for clubbing and daily use.